Who the hell orders a mint julep on a Saturday night at a drag show? Apart from my previous singular experience with friends at a gay bar in West Hollywood, this was the first time I was alone in a queer space. In Orange County, where I grew up, queer spaces are few and far between. I didn’t want to awkwardly be the introverted and quiet queer that I am in social settings. While taking in the show, I befriended a gay man, and we bonded over the fact that we both happened to order mint juleps on Saturday night at a drag show — because, honestly, who does? He seemed quirky and funny to say the least. A similar event happened in 2017, when a racist tweet surfaced from famous gay makeup vlogger and CoverGirl spokesperson James Charles. The tweet included a line that said, “I can’t believe we’re going to Africa today omg what if we get Ebola?” Immediately after that, Charles removed other racist tweets that were discovered on his account. Despite backlash from concerned consumers, CoverGirl’s response was cringeworthy: The company didn’t fire him to hold him accountable for his racism. These instances of overt racism and microaggressions contribute to a culture that normalizes racism and violence. Language shapes our views and perceptions of the world around us. Microaggressions and racist language within our community reinforces systems of oppression. LGBTQ folks experience oppression at the intersection of our differing identities, but we can also be enforcers of oppression. But how can we not talk about race? According to the Human Rights Campaign, of the 102 reported trans individuals killed from 2013-17, 87 were people of color, with 75 of them identifying as Black. At least 88 were trans women. Transgender women are also four times more likely to be victims of a homicide than the general population of all women. Intersectionality of identity provides the lens of how systems of oppression such as racism, classism, sexism, homophobia, transphobia and ableism work together. This notion was coined by Kimberlé Williams Crenshaw to recognize power dynamics and privilege in society. Understanding our role in maintaining systems of oppression is essential for our liberation. As a white femme, I walk through the world with privilege and experience queerness differently because of my whiteness. I am by no means trying to speak on behalf of or for people of color. Nor I am trying to homogenize a singular experience of queerness as dogmatic. My goal is to simply bring light to an issue that is so often left out of conversations within the LGBTQ community. Fellow white members of the LGBTQ community, we need to do better. It’s not enough for us to not be racist — we need to be actively calling out racism within our own community and ourselves. Queer and trans people of color have led the movement for equality and are the reason the LGBTQ community has made the social progress it has today. So where is your goddamn respect? 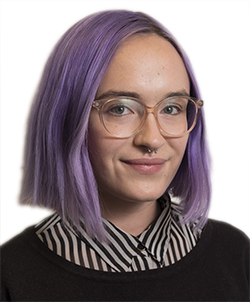 Kaitlyn Hodge writes the Thursday blog on queer issues. Contact her at [email protected] and follow her on Twitter at @kaitlynhodge.